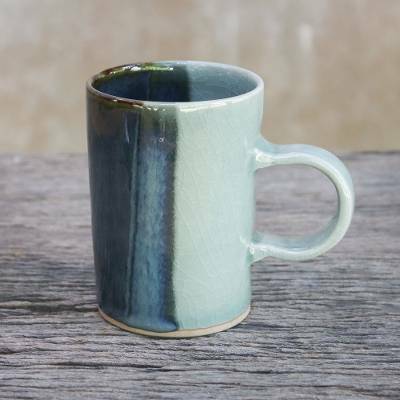 Handmade Indigo Painted Celadon Ceramic Mug from India, "Dual Classic"
Celadon-style glaze with its natural crackled effect distinguishes this handmade mug from Duangkamol. A pottery technique that goes back two millennia, the distinctive color of celadon was prized for its similarity to the color of jade and was highly valued in East and Southeast Asia. Iron in the clay reacts to the heat of firing to create the blue-green hues. Half of the mug is painted in an indigo blue shade that gives the mug a unique two-tone look.